Claudia Doppioslash is a Graphics Programmer, a speaker and an author. Her favourite achievement as a gamedev, is having built a Physically Based lighting system from scratch for Unity. 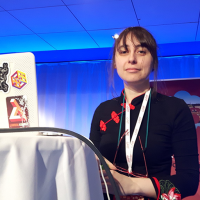 She's the author of the Apress book "Physically Based Shader Development for Unity 2017", and of the Pluralsight course "Developing Custom Shaders in Unity". Easily bored, she has jumped from industry to industry, in search of interesting challenges. Hence the variety of fields she's been in: mobile dev, gamedev, and functional programming. She's particularly interested in physically based rendering, procedural techniques for game art, and in developing AI for storytelling. She likes to share her knowledge, taking pride in delivering it in a streamlined, and time-effective way. The Physically Based revolution has been around for a while now. Even though you have adopted PBR successfully, you might still have many unanswered questions about how it works. Why doesn't the Substance Designer preview viewport match the results in engine? While we're on that topic, why no viewport in any program matches another software's viewport exactly, ever? What are Linear and Gamma precisely, and why do we bother with them? What practices which were absolutely common before Physically Based workflows arised, are going to break the realism of your materials in subtle ways? This talk has (most of) the answers to these, and many other questions you might have about Physically Based Rendering. Claudia Doppioslash guides you through the maze of Physically Based workflows, showing you how the physics of light impacts your workflows in practice. And including only sporadic references to mind-bending physics.